A day earlier than expected, Oscar Pistorius was released from a South African prison and ferried away at night to his uncle’s house in the suburb of Pretoria, where the former Olympic athlete will serve out the remainder of his punishment for fatally shooting his girlfriend, model Reeva Steenkamp, through a bathroom door in 2013. 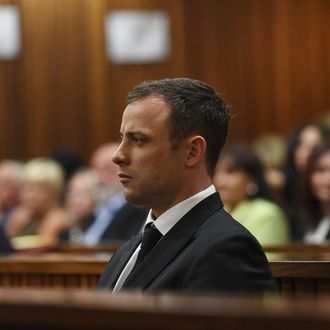 The 28-year-old Pistorius was found guilty last year of “culpable homicide” — or manslaughter — in Steenkamp’s death, but cleared of the more serious charge of murder. The athlete had argued that he believed Steenkamp was an intruder. He was sentenced to five years in prison and, as of his release yesterday, had spent less than a year of that term behind bars. The runner’s move from lockup to house arrest was expected; he was originally slated for release in August, but the justice minister, seemingly under political pressure, overturned his parole. Pistorius got a second hearing and was granted permission last week to transition to supervised house arrest until 2019. Pistorius must check in daily, but he doesn’t have to wear an electronic-monitoring bracelet and can leave the house to work, attend family events, and complete community service, according to South African outlet eNCA. He must return to his uncle’s home — a gated compound with a pool and private gym — every night, but can’t travel or own firearms, and has to take frequent drug and alcohol tests and meet with a therapist on a regular basis. It’s unclear if his athletic training can count as work. His lawyers say it does, but Pistorius is banned from international competition (under the International Paralympic Committee’s rules) until he finishes his sentence — so Tokyo 2020 is the earliest he could probably return. Sources have told the BBC that months in prison have taken a severe physical toll on Pistorius, and it’s unlikely he’d even be able to compete any time soon — if at all. Pistorius must also meet with Steenkamp’s family — another provision of his release. Steenkamp’s family is prepared to meet face-to-face with the “Blade Runner,” but according to the family lawyers, they are waiting for “the right time,” and no date has been set. A family spokesperson said, upon hearing the news that Pistorius had been secreted away to his uncle’s, that his release “makes no difference to their lives because Reeva is still not coming back.” Previously, Steenkamp’s parents had adamantly protested the decision to shorten Pistorius’s prison time. But there’s still an element of uncertainty around Pistorius’s fate. South African prosecutors are appealing the original manslaughter verdict and pushing to retry Pistorius for first-degree murder. That first hearing date is November 3, where prosecutors will once again argue that Pistorius killed Steenkamp after the two fought, and that the judge’s support of his self-defense justification was “shockingly inappropriate,” according to The Guardian. If prosecutors are successful, it’s possible Pistorius could find himself in prison once again — this time for a sentence as long as 15 years.